A walk along a track following the banks of meandering Glengalmadale River to Glen Galmadale Dam with its fish ladder. 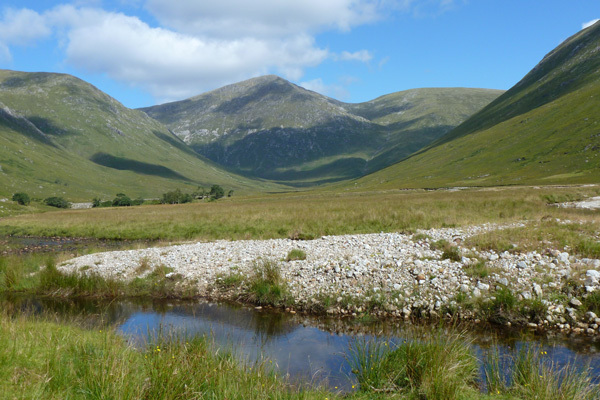 There are lovely views of the surrounding high ridges, with the peaks of Beinn na Cille, Fuar Bheinn, Creach Bheinn, Maol Odbar, Meall nan Each dominating the landscape; part of the Galmadale Horseshoe. 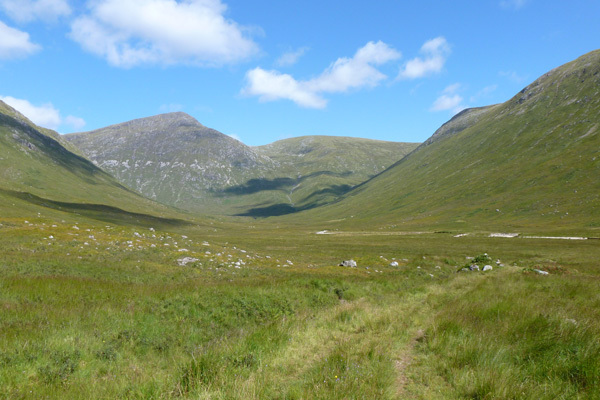 A complete circuit of the ridges forms part of the strenuous 16km Creach Bheinn & Fuar Bheinn: Galmadale round walk. 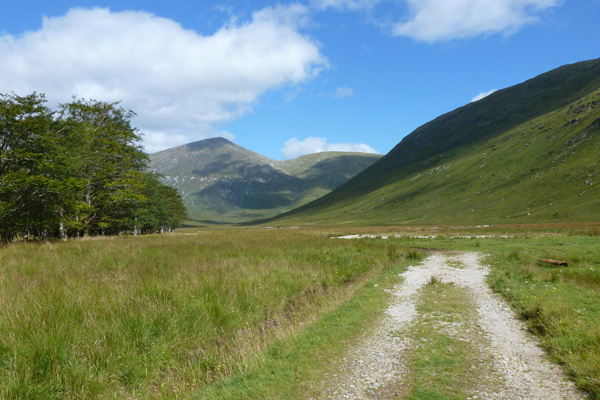 This is a lovely gently walk in a flat U-shaped valley across wet heath and grassland, with wooded sections (consisting mainly of beech, rowan, spruce and alder; both natural and planted). The herbaceous flora is variously hued throughout the season with purple moor grass (Molina caerulea), heather (Calluna vulgaris), bell heathers (Erica tetralix and E. cinerea), bog myrtle (Myrica gale) and bog asphodel (Narthecium ossifragum) and devil’s-bit scabious (Succisa pratensis), with meadowsweet (Filipendula ulmaria) and marsh ragwort (Senecio aquaticus) in wetter areas. Insectivorous plants, such as butterworts and sundews (Pinguicula and Drosera spp) and variety of Sphagnum species characterise the boggy sections. The track is clearly defined although some sections can be very muddy; there is also ford crossing, which may be impassable after heavy rain. 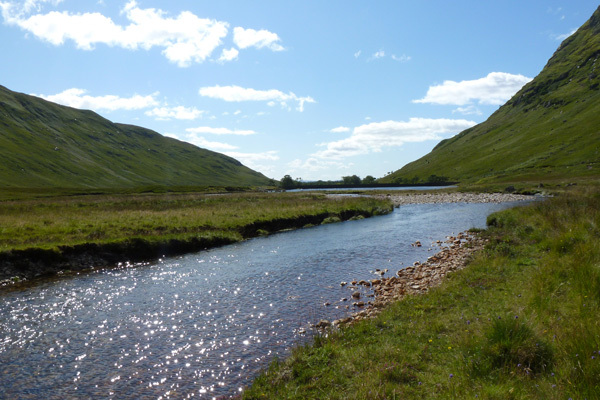 The track stops just after the Glen Galmadale Dam at a footbridge, but you can continue to a waterfall seen in the distance, passing through several fords on route marking the outflow of numerous mountain burns into the River. However, this section (marked as a footpath on the OS map) is not included in this walk as the path is very indistinct and traverses wet heath and bog. This section should only be done by experienced walkers with waterproof footwear, walking pole, map and compass. 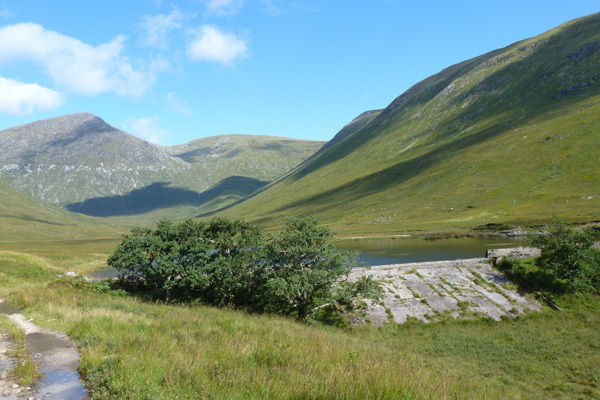 Glen Galmadale Dam and its fish ladder were designed by Malloch of Perth and built between 1908 and 1910 to provide a freshwater fishing loch for the Kingairloch Estate. 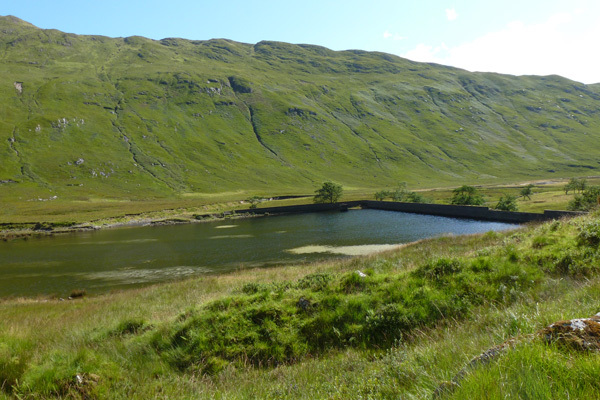 The fishing ladder was designed to allow natural colonisation of the ‘loch’ by salmon and trout. Unfortunately, the design of the dam was ill conceived, being subject to flooding, and the ladder failed to function as intended. The aspiration of an income source from estate fishing had to be abandoned after considerable expense. Look out for raptors, corvids and red deer in the hills, and pipits and larks on the heath land. Take time for a spot of dragonfly stalking on route. In the wider area, the remains of nine structures surviving as ‘dry stone footings with varying levels of preservation’ have been recorded by Royal Commission on Ancient and Historical Monuments Scotland (RCAHMS). These have been identified as possible shielings huts (small stone seasonal dwelling in upland areas for inhabitants tending livestock). 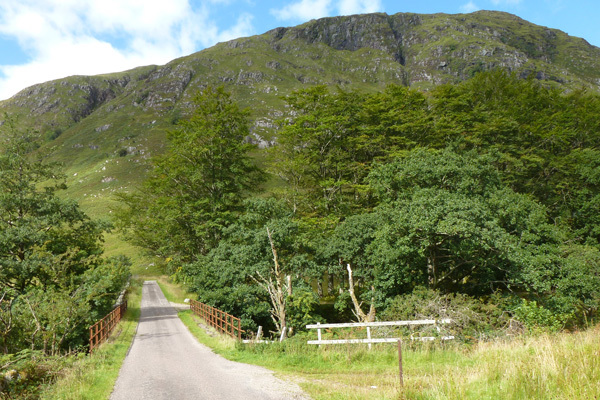 It is advisable to contact Kingairloch Estate before walking in the area during the stalking season. 1. Park at the designated car park just east of Glengalmadale River. 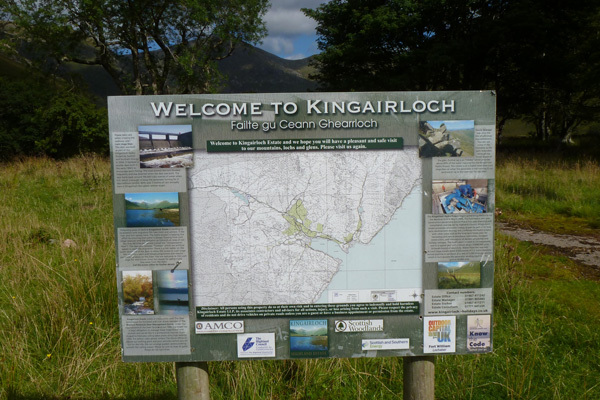 There is an interpretation board by Kingairloch Estate displaying the route of the walk. The start of the walk is on a track just west of Glengalmadale River, i.e over the road bridge. Take the track through the metal gate (which may be open) and follow the track as it skirts along the tree-lined banks of the River. 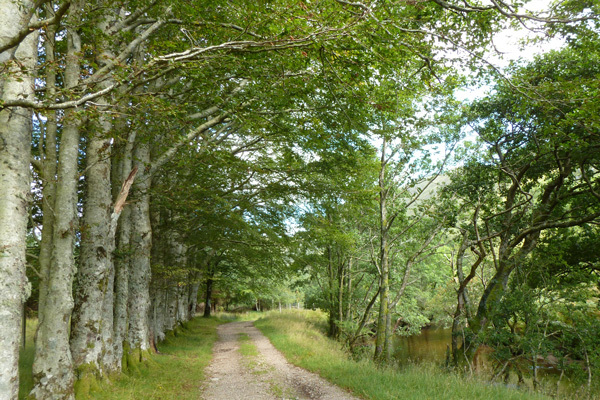 You are immediately welcomed by a fine row of beech on the left, before the track crosses heath and grassland, with patches of woodland and plantation on the left. 2. Cross the ford and then pass through another metal gate by a shooting range (with metal deer target and stands). 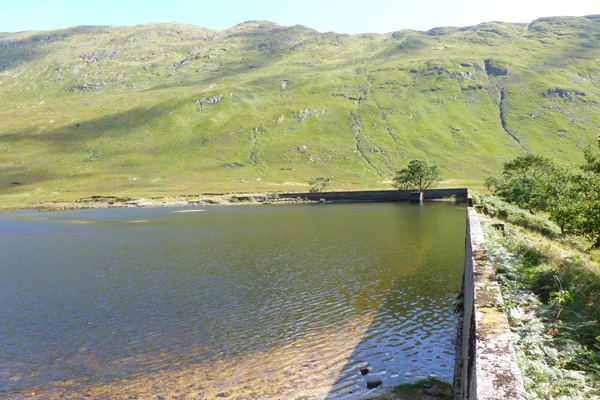 The track passes by the western edge of the Glen Galmadale Dam whose southern edge is reinforced by concrete, and the associated fish ladder. Take time to admire this ill-fated structure, constructed as a freshwater fishing loch in the 1900s at considerable expense. 3. The track finishes at a rickety bridge, where you have opportunity to admire the waterfall in the distance and the ridge fabulous views in all directions. 4. Return by the same route. You can continue to the waterfall, although the footpath is indistinct and traverses a bog. This route is not advisable after wet weather as the river is subject to flooding and can be dangerous.